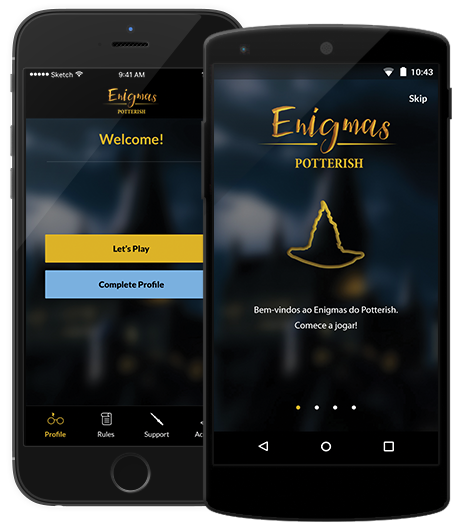 Enigmas is fun new game for fans of Harry Potter by Potterish. It's a series of brain teasers, which will start off gently, but will get more and more challenging as we go. For each challenge, you'll see an image relating to the Harry Potter universe, along with a word or short phrase, then you just need to work out the answer as quickly as possible. If you get stuck, you can ask for a hint (called a TIP). But, to keep things interesting, there are only a limited number of tips available, and we'll add four minutes to your timer when you use a tip. Oh, and you might not find all the tips that helpful, so think twice before using one! When you play, you'll be ranked against all othe Enigmas players across the wizarding world. - The number of puzzles you've solved. You can only play three challenges per day, so don't get too frustrated when you hit that number - just remember to come back the next day for more brain teasers. Game avaiable in English, Portuguese and Spanish languages. Avaible on Playstore and in the Appstore. This application have no official affiliation with Warner Bros/JKR or with the Copyrighted Harry Potter (TM) Brand.